Our pilgrimage took us from Paris, Lisieux, Omaha Beach, Mont Saint Michel, the Shrine of Saint Anne in Aurray, and then south to Lourdes. Here we pondered another powerful cause for the explosion of religious fervor in the 19th Century: the apparitions of Mary first at La Salette, but then in Lourdes. 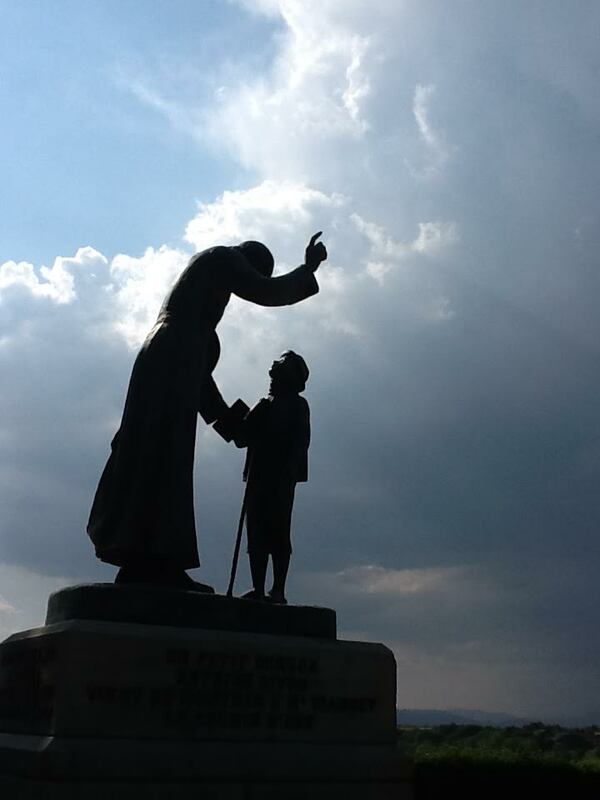 We will tell more about LaSalette in a later post. I want to share first about Lourdes. Following on the heels of the solemn definition of the Immaculate Conception (1854), a young girl from an impoverished family saw a beautiful woman who confirmed this teaching (1858). Mary who disclosed her presence to Saint Catherine at Rue du Bac as conceived without sin was not only praying for those who had recourse to her, she was executing a daring plan. Just like she implicated Catherine Laboure in bringing hope to the despairing, she also pulled Bernadette into her web of grace to encourage those who need a reason for their hope. Identifying herself as the Immaculate Conception, Mary told Bernadette that a Shrine should be built over a grotto near a river where she stood. Mary also told Bernadette to dig and then to drink and to bath in the water that flowed there. The water was to be a sign of conversion and bathing in it an act of making a new beginning in the spiritual life. Mary explained that there would be miracles, (and it is beautiful to see the great faith not only of the sick but also their caregivers), but these signs were meant to stir confidence so that many souls would return to God and live holy lives. Bernadette did as she was told even though it was a trash dump and she also told the local priest to build a Sanctuary even though the priest thought her to be delusional. Yet it was this radical obedience without regard for herself or what others thought that allowed Mary to bring forth a source of spiritual renewal for the whole world. The axiom that God is not limited to the most powerful and greatest, but allows himself to be contained in the weakest and least is in the story of Bernadette fully illustrated. Bernadette eventually entered religious life and embraced a life of silence, anonymity, and intercession. When asked about mental prayer she explained the importance of welcoming Christ and showing Him hospitality in the heart. She said that when Christ feels welcome, He is a good guest: He never forgets to pay the rent. The day after Pentecost, Fifty-two of us chiefly from the Shrine of Saint Anne in Colorado but also from other parts of the USA started in Paris. In 1834 on Rue de Bac Mary appeared to one of the spiritual daughters of St. Vincent de Paul. She had grown up as in a peasant farming family just after an era in which the French Catholic World was turned upside down. Part of our pilgrimage in the footsteps of the saints of France was dedicated to understanding the spiritual explosion that Saint Catherine's obedience to The Lord ignited in the 19th Century. Leading up to what happened at Rue de Bac had been a time flowing with the blood of martyrs. French secularists viewed religious culture, contemplative thought and Christian virtues as a threat to progress. In genocides that would later be replicated in the 20th century by both Russian Communists and German Fascists, blood flowed not only in Paris, but military commanders proudly reported, along with the destruction of Catholic villages, also the thorough massacre of all women and children in those communities. In the New France of liberty and fraternity, faith could not be tolerated and people of faith needed to be carefully terminated. Against this heartlessness, Catholics bore witness with their lives that the deepest truth about humanity is to be found not in our science, nor in our productivity, nor our politics. Instead, they stood up for our capacity to worship as spiritual creatures who show mercy to one another because of the Divine Mercy shown us. Notwithstanding the heroic witness of many, after the French Revolution and Reign of Terror, the average Catholic was demoralized and confidence in the faith undermined by political and social design. Later, the Napoleonic Wars exacerbated the plight of the poor who not only could not count on the state but also despaired to rely on God- les miserables. Yet it is from the poor in an era when the faith was the most challenged and all seemed lost that some of France's most important saints were born. In the 19th Century, France would be home to an explosion of religious devotion ending with the two sisters in the Spirit Blessed Elizabeth of the Trinity and doctor of the Church Saint Therese of Lisieux, but beginning with the Cure d'Ars, Saint Bernadette and Saint Catherine Laboure. They were disenfranchised from their society and culture, sometimes misunderstood by the Church itself, and without any economic or political power. Biblically, we could identify them with the anawim, the lowly for whom The Lord does great things. Both France and the world were impacted by their faith in the Risen Lord. As we approached the chapel at Rue de Bac where Mary revealed her presence to Saint Catherine, it seemed hard to believe that no one could have predicted the birth of a quiet, competent, down to earth mystic in Catherine's day. The assumption would have been the opposite. In the New France, like present day Pop American culture, salvation was believed to come from faith in science rather than faith in God. It was a tyranny of heartless reason demanding absolute homage to the political and material realities of life. The deeper and more noble aspirations of humanity were regarded as little more than a threat to progress. In such an environment, one would expect not the emergence of saintly intelligence of heart but rather a more heartless genius, less maternal, more capable of competing in the new will to power. Catherine Laboure was a mature religious when Our Lady appeared to her in 1834. She was well aware not only of the spiritual material poverty but also the spiritual emptiness that had robbed people of their hope. And for love of The Lord, she had dedicated herself to these - les miserables. The message of our Lady of Grace also spoke into this misery. Mary asked that a medal be struck with her image. Her hands were to be outstretched with rays coming from them. Anticipating the dogmatic definition of the immaculate conception, she also asked thar Around this image the words "o Mary conceived without sin, pray for us who have recourse to thee". With the permission of her bishop, the medal was struck and distributed. Despite the rapid growing popularity of the devotion, Catherine stayed in the background and continued to live in the obscurity of religious live, anonymous and unknown to the world. Only in the last years of her life did she reveal herself as the mystic behind the medal. By then the medal had a nickname, the Miraculous Medal because of the many miracles associated with it. This humble beginning may seem to many as insignificant. It was indeed only a spark in the heart of Paris. But this spark together with the obedience of other humble, poor and confidence souls will lead to an explosion that continues to rock the Church and the world today. Our pilgrimage began by pondering this spark in Paris, but as we progressed, it would take in the blaze of 19th Century Devotion that Saint Catherine helped to ignite.